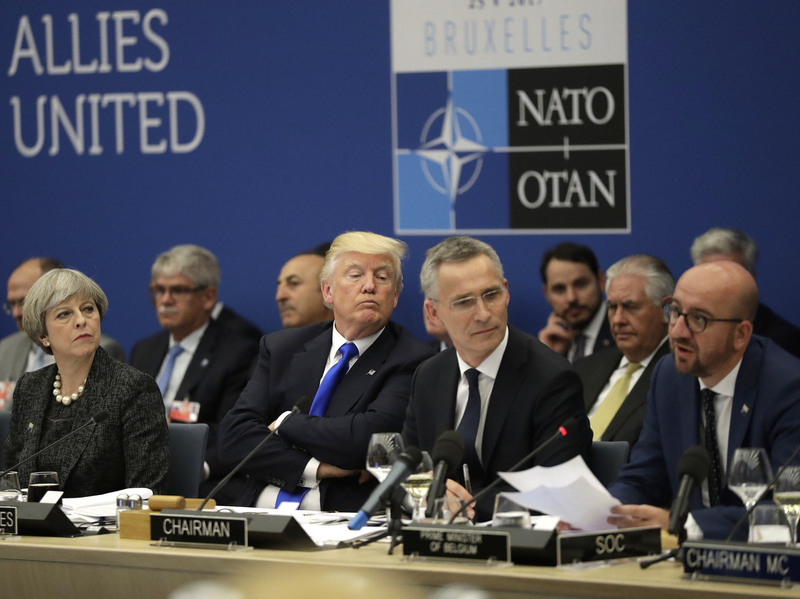 'No One Wants To Look Like Trump's Poodle': NATO Allies Gear Up For Brussels Summit Trump has shown he has no qualms about upending established policies or pacts with global partners, and has explicitly tied security issues to trade and economic ones. That's making allies nervous. British Prime Minister Theresa May, U.S. President Trump and NATO Secretary-General Jens Stoltenberg listen to Belgian Prime Minister Charles Michel speak during a NATO summit in Brussels on May 25, 2017. With his escalating complaints that the United States contributes more than its fair share to defense, and vague threats to countries that do not spend more, Trump is diluting the alliance's appearance of unity, say diplomats and analysts. And, the prospect of a less-than-committed U.S. has thrown some of Europe's military weaknesses into plain view. The main idea behind the North Atlantic Treaty Organization, formed in 1949 in the first frost of the Cold War, is that an attack against one member state is considered an attack on the entire bloc, which should respond with actions. The alliance invoked that concept after the Sept. 11, 2001, attacks on the U.S. and deploys international forces alongside U.S. troops in Afghanistan and other parts of the world. But Trump has called into question whether the U.S. should continue to uphold its guarantees to NATO. In a couple of tweets on Monday, he said "NATO benefits ... Europe far more than it does the U.S." And he told supporters at a rally in Montana last week that he had told German leader Angela Merkel, "We're protecting you, and it means a lot more to you ... because I don't know how much protection we get by protecting you." The United States outspends every country on the planet on the military, and its defense spending makes up more than two-thirds of NATO's indirect costs. For years, U.S. leaders have pressed allies to up their spending, rather than "holding our coats while we did all the fighting," as President Barack Obama put it in 2016. The United States is projected to spend 3.5 percent of its gross domestic product on defense this year, according to new NATO estimates. Germany, Europe's largest economy, will put little more than 1.2 percent of GDP this year, and only a handful of member states are expected to spend at least 2 percent. The alliance agreed members should aim for the 2 percent goal within a decade after Russia annexed Crimea from Ukraine, which cooperates with NATO, in 2014. However, allies seem more concerned by Trump's approach than his predecessors'. That's because he has shown he has no qualms about upending established policies or pacts with global partners, and because he has explicitly tied security issues to trade and economic ones. "They kill us on NATO," Trump told the rally in Montana. "Of course, they kill us on trade. They kill us on other things. They make it impossible to do business in Europe, yet they come in and they sell their Mercedes and BMWs to us." Previously, trade and security were always considered separately, said Roland Freudenstein, head of research at the Wilfried Martens Centre for European Studies in Brussels. "Through the entire post-World War II history, economic relations and security relations were largely compartmentalized in the Atlantic context," said Freudenstein. "They were independent of each other." He continued, "suddenly you have a situation where the U.S. president wants to connect the two things. And that is a change that Europe has a problem to deal with." When the president put tariffs on steel and aluminum imports, which affected key trade partners including European countries, he cited national security concerns as his reason. He may have had political reasons for tying trade to security: It allowed him to bypass Congress as he imposed the tariffs. But Freudenstein says Europeans did not necessarily understand that. "There is a communication problem there," he said, adding that the controversial moves could have the adverse effect of making it difficult for European leaders to legislate to increase their defense budgets. "No one wants to look like Trump's poodle." Although diplomats say Trump's tone concerns them, they say they continue to see impressive U.S. investment in Europe and would be surprised if the U.S. dramatically decreased its commitment to NATO. Yet, even leaving America aside, there is pressing business at the summit about NATO countries' fitness to fight. Analyst Karlijn Jans of the Hague Centre for Strategic Studies said there have been numerous governmental and independent reports "talking about the dire state of especially European militaries — in terms of how they're able to deploy, if they can work together in the battlefield, communicate with each other." Jans said it is vital to discuss not just how much countries are spending but if they are doing so in a way that makes them able to work together. Since Russia's 2014 annexation of Crimea, the country has built up its forces close to Baltic states. A recent report by a British parliamentary committee noted Russia has conducted three times as many military exercises as NATO countries in the last three years, and ramped up submarine activity, too. Since then, NATO has also increased exercises and spending and deployed troops from about 20 of the allies close to Russia. But analysts and defense officials say work remains to be done. Cold War-era contingency plans for Western troops and military hardware to move swiftly across Europe have lapsed. Border issues and inadequate infrastructure mean it could take weeks for forces to move across the continent in the event of an emergency, according to the British report. Tuesday's signing of a declaration on European Union-NATO cooperation is part of a plan to address those issues. While Trump's July 16 summit with Vladimir Putin in Helsinki will be closely watched, "there are a lot of more threats towards the NATO alliance than just Russia," said Jans. She said the rise of China, and terrorism, are matters that should also be firmly on the organization's agenda as it meets Wednesday. Alice Fordham reported in Brussels. NPR producer Samuel Alwyine-Mosely contributed reporting in Brussels. NPR national security correspondent David Welna contributed reporting from Washington, D.C.